From a Native Canadian woman! With a little research I discovered that a comment thrown out in response to another of Donald's "Pocahontas" name calling, was from a Native Canadian woman! A Calgary-based media consultant is making headlines and trending on social media after she shouted an objection to Donald Trump's use of the word Pocahontas to describe a United States senator. 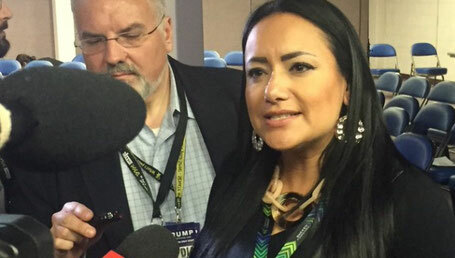 Nicole Robertson, president of Muskwa Productions and Consulting, was in the audience when the presumptive Republican presidential nominee was speaking to the media before a rally on Thursday in Bismarck, N.D.
That prompted Robertson, who works to promote awareness about Indigenous peoples, to shout out, "That's very offensive, sorry." The article goes on... "Pocahontas" is now seen by many aboriginal people as a racial slur. The fact that Trump seemed unaware of the word's power to offend suggests he is ignorant when it comes to Indigenous issues, Robertson told CBC News. "He's coming from a very amateur perspective," she said. "There needs to be, full out, an apology, number 1. We, as Native American, Native Canadian women have gone through enough marginalization, victimization." Robertson said her exchange with Trump has put her at the centre of a media frenzy as she continues to get interview requests from news organizations all across the continent. "It has become a topic of discussion for all the major U.S. networks," she said. While some of the reaction on social media has been racist and hateful, Robertson said most people have congratulated her for speaking out. "I'm just so appreciative of the support," she said. There. Somebody spoke out. It got some attention. But I have heard nothing since. And this is a Canadian woman reported on by a Canadian news source. But I can look deeper. Or maybe it's time for a bit of a break. Hobby time!